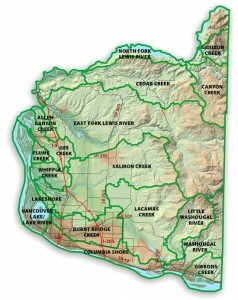 Clark County, WA, was the first county to be established in Washington State and is now the fifth largest county in the state by population. Situated on the Columbia River, Clark County is north of Multnomah County and is often included in the Portland, OR, metro region. Part of the Pacific Northwest, Clark County is an outdoor lovers dream. With the Columbia River to the south, the gorge to east, Mount St. Helens to the North and the Pacific Ocean to the West, Clark County makes for the ideal home base for any outdoor adventurer. Hiking, snow sports, water sports, or even a leisurely walk along the river are all within a 90-minute drive. Clark County offers several types of lifestyles. In downtown Vancouver, there is an urban feel with several restaurants and bars – and brewpubs! – anchored by Esther Short Park. During the summer, wine and beer fests take place and live music can be heard on a weekly basis. The further one ventures away from Vancouver, though, the landscape turns more pastoral, with farmland available a few minutes away. Battle Ground, La Center, Ridgefield, Camas and Washougal all have smaller downtowns and boast a more rural lifestyle. In addition to the scenic features, Clark County is home to several quality school districts: Evergreen, Vancouver, La Center, Ridgefield, Camas, Washougal, Battle Ground, Hockinson and Green Mountain. With many magnate schools, Advanced Placement programs and International Baccalaureate high school, students have access to great educational opportunities. As mentioned before, just to the south of Clark County is Portland, OR, the largest city in Oregon. Entertainment choices abound in Portland, with almost every type of restaurant cuisine available, live music venues and professional sports. The Portland Trailblazers and Portland Timbers are the two major teams in town, and the Portland Winterhawks have been delighting hockey fans for decades. The Portland International Airport is just across the river, too, making air travel a snap. No matter if you like wide-open spaces or the hustle and bustle of city life, Clark County can offer either lifestyle and so much more. Interested in moving to Clark County? Let Rowena Lusby help you look for your new dream home right here in the Pacific Northwest.